So many people ask what inspired Bree & Carlos to the Build the first farmhouse table or start the first workshop. And the answer is pretty simple: Family, Faith, Food & Community. Growing up Bree's parents always had beautiful dinner parties, lunches and social gatherings. She was never the child that was sent to her room to play. Yet she was the little girl that prepped the stuff mushrooms for appetizers or rolled the lemons on the counter to soften for the sweet tea. So of course she grew into an adult that loved to entertain. 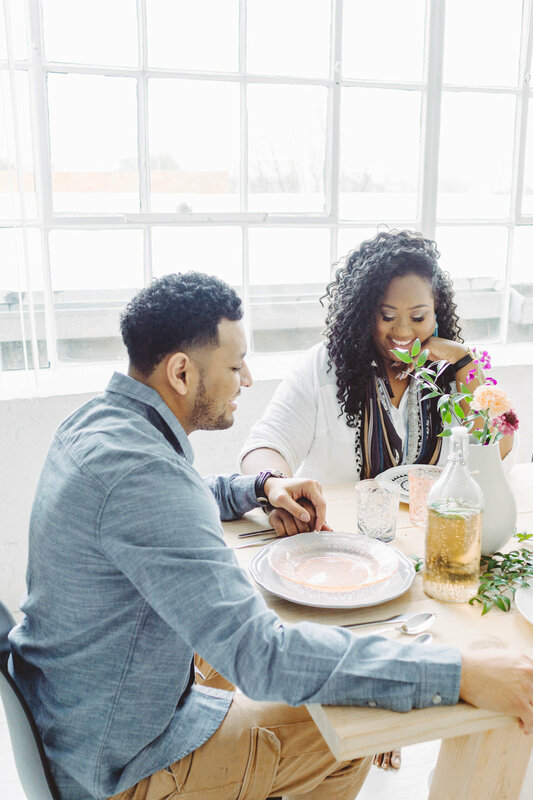 Laughter, great conversation & fabulous food have fueled both Bree & her husband passion & life. This passion has led to these fabulous & unique brands. Lavender & Mint Designs, The Iman Project, #TheKoolKids & Mama Mode. Ever wondered where Lavender & Mint Designs name came from? Every evening Bree's mother wouldn't let them sit down for dinner until her father came home from work. In the backyard grew fresh lavender & mint. Each evening for the sweet tea her mother would send her to the backyard to gather it for the family meal. To this day the smell of lavender & mint brings warm feelings and sense of peace that comes over the family. Good memories brings joy & laughter to the present & the future. You can share memories, you can share laughter. you can share food. So why not share them around a farmhouse table or at an empowering workshop. Carlos & I believe that our passion & our work ethic will lead to all of our dreams becoming a reality. We believe that any next step that we are shown or move towards is because God is allowing us to do so. We both believe that every home should have a Farmhouse Table. Every person should experience an empowering workshop. Every Mama should have some me time...and every kid is pretty dang cool. This is our story, This is our season....This is The Iman Project.